Busloads of protesters traveled to Victoriaville, QC arriving in the city the afternoon of May 4. Provincial police force Sûreté du Québec had secured the perimeter of the hotel in which the general council took place. Reports from the scene stated that protesters pushed through barriers and threw projectiles at police lines. Rubber bullets, CS gas and smoke grenades were deployed by the SQ. Ambulances were called to the scene, and at least five protesters were admitted to the hospital. Radio-Canada video footage also shows one police officer being hit by protesters. Around 9 p.m., Concordia campus television station CUTV ended their live broadcast stating that the protestors were dispersing. Busloads of protesters began leaving the city; based on reports from Le Délit’s reporter on the ground, a bus carrying McGill and Concordia students was the last to leave. 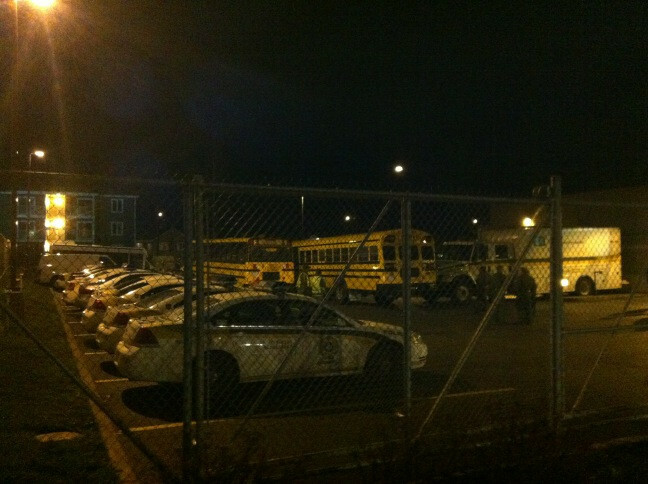 The bus was escorted back to Victoriaville by police, and passengers were placed under arrest. The passengers allegedly under arrest are unable to be contacted, but include a journalist from Le Délit and The Link. Students at the nightly demonstration in Montreal held a solidarity sit-in on Mont Royal Ave. and St. Denis Rd. for those who were arrested in Victoriaville.